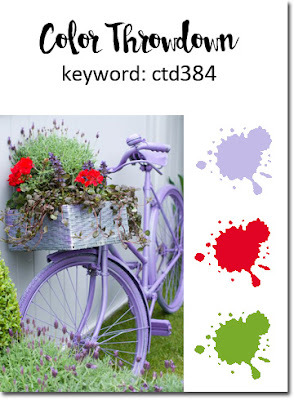 It’s time for a new Color Throwdown, and this week, for CTD384, Barbara is hosting and has a lovely color combo…lavender, red and green! I’ve paired this week’s Color Throwdown with the current Mojo Monday Challenge, MOJO439! I started with the main panel, which I cut from Sweet Tooth Card Stock using Blueprints 27 Die-namics. This panel is EVERYTHING. I LOVE these new Blueprints! I used the Stitched Rectangle STAX Die-namics to cut a panel of paper from the Tranquil Textures Paper Pack. LOVE. I used another pattern from this pack for the horizontal panel, which I trimmed down using Blueprints 27 Die-namics so that the scalloped edges match up. I cut a panel of Sweet Tooth Card Stock using the Stitched Mini Scallop Circle STAX Die-namics and stamped “THANK YOU” and “for brightening my day” from LJD Spring Wreath using Black Licorice Premium Dye Ink. The flower was cut using Blueprints 12 Die-namics from Cherry Crisp Prestige Card Stock and the leaves were cut from Dill Pickle Prestige Card Stock. Leslie Miller, this month’s AMAZING Guest Designer! Lee Ann Barrett, this week’s Guest Star Stamper! Love that pop of red in all that purple, gf!! !